The Staff Picks badge is a way for the Skillshare team to highlight exceptional teachers who go above and beyond to provide students with a valuable, engaging experience. Demystifying: A Staff Pick class provides information that is insightful and accurate, never superficial. Through a wide variety of helpful tips, examples and frameworks, the teacher shares a distinct and unique perspective that demonstrates deep engagement within a field or practice. Actionable: A Staff Pick class situates insights in a wider context, teaching students not just one new thing, but a new kind of thing. Students gain an understanding of how to use their new skills in their daily life or work and are equipped to approach problems and questions in new ways. Organized: A Staff Pick class presents ideas in a structured way, using clear signals and sequences to guide students toward success. The class moves at a pace that is appropriate to its level. Personal: A Staff Pick class is engaging and authentic. The teacher connects with her students by speaking to them directly with warmth and respect, referencing personal experiences and examples. Clear Value Proposition: A Staff Pick class sets clear expectations by establishing who the class is for and delivers on what it promises, giving students a sense of accomplishment. They are pleased to have investment their time - it was worth it. Polished: A Staff Pick class makes a great first impression. Its title and description is both accurate and compelling. It is free from typographical errors. Links are clean for easy user navigation. A/V quality is clear and not distracting. The narration is organized and concise, and students can take confidence that the teacher has invested effort and is a trusted guide. Relevant: A Staff Pick covers a topic that is relevant to a wider industry or audience conversation. It pays attention to the details that are relevant to its field, using an up-to-date aesthetic and consistent design throughout the content, presentation and resources. Compelling: A Staff Pick is engaging and inspiring. Through the use of regular visual changes, cohesive lessons, and a motivational style, the class makes a lasting impression and reinforces Skillshare’s mission: help students learn skills to level up their career and pursue the work they love. How many classes will be selected as Staff Picks? When we launch Staff Picks the week of June 18th, approximately 60 classes published since January 1st, 2018 will receive a Staff Pick badge. Moving forward, our team will select a few new Staff Picks each week. How often will Staff Picks be selected? All newly published classes will be eligible for review by our curation team, and new Staff Picks will be selected weekly. How will I know if my class has been selected? 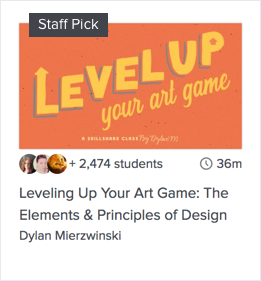 If your class is selected as a Staff Pick, we’ll email you with a big ‘congrats!’ Plus, you’ll see the Staff Pick badge on your class thumbnail wherever your class appears on Skillshare. Will the Staff Pick badge change Skillshare’s discovery algorithms? No. Skillshare’s discovery algorithms will continue to be powered by a variety of factors that take into account how the community is responding to a class. Classes without the Staff Pick badge will continue to have plenty of opportunities to get discovered throughout the site. What is a Skillshare Original and can it receive a Staff Pick badge? A Skillshare Original is a class produced in partnership with Skillshare’s in-house content team. Skillshare Originals are not eligible for the Staff Pick badge. What else can I do to get a Staff Pick badge? The best way to get a Staff Pick badge is to focus on creating a high-quality, well-organized class full of valuable insights and takeaways. We know that this takes time and effort, and we’re here to support you! We encourage you to check out our Teacher Handbook, as well as our blog posts that dive deep into specific aspects of teaching. A latest team favorite: Taking Your Skillshare Class from Good to Great. Please don’t hesitate to contact us at teach@skillshare.com if you ever have questions or would like feedback on your class!